The previous two posts talked about surgery and chemotherapy as options in cancer treatment. The last option to be discussed is radiation therapy. Often, radiation therapy is used in conjunction with surgery and chemotherapy to treat cancer. Radiation therapy is the usage of high-energy waves and particles (radiation) to attack cancer cells. There are many types of radiation. Microwaves use radiation to heat up food. Likewise, x-rays use radiation to image bones. Radiation therapy uses the same radiation as x-rays in higher doses to treat some types of cancer. With radiation therapy, special equipment sends high doses of radiation to the cancer cells or tumor. The radiation either kills the cancer cells or prevents the cells from growing and making more cancer cells. The radiation also affects healthy normal cells near the tumor but normal cells can repair themselves while cancer cells cannot. Radiation therapy is different from chemotherapy in that radiation only affects the part of the body being treated while chemotherapy affects the whole body. As a result, radiation is used for localized tumors while chemotherapy is used on patients that have cancer in multiple areas. Radiation can be administered in two ways: external beam radiation and internal radiation therapy. External beam radiation uses a machine to send high-energy radiation from outside the body to the tumor and some of the area around the tumor. 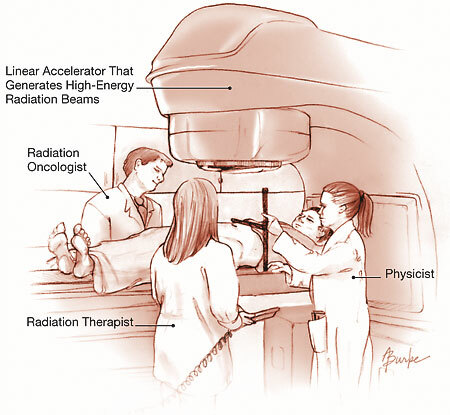 External beam radiation treatments for most people are 5 days a week for 1 to 10 weeks. The number of treatments required depends on the size and type of cancer, how healthy you are, and what other treatments you are receiving. External radiation therapy is painless and takes only a few minutes, however, it takes time to set the machines up so appointments generally take 15 to 30 minutes. While receiving treatment, the patient will lie flat on a treatment table under the radiation machine. While the machine is working, the patient will hear a number of clicking and whirring. As stated previously, the treatment should only take a few minutes. Internal radiation therapy involves using a source of radiation that is located inside the body. The source of radiation may look like a wire or pellet and is called an implant. The implant is inserted very near or inside the tumor and the radiation travels a very short distance. Implants are placed in the body using needle-like tubes. The implants can either be left in or taken out. If the implants are left in, you will not be allowed to do certain things like being near children or pregnant women for a short period of time. Implants will stop giving off radiation after a few weeks and well cause no harm. Other times, the implants are taken out after they have been in place for several hours or days. While the implants are in the body, the patient must remain in a private hospital room. Doctors and nurses will monitor the patient but they will have to limit contact with the patient. After the implants are removed, the treated area may be sore but normally, patients get back to normal quickly. As with the other treatments, there are a number of side effects associated with radiation therapy. The most common side effects are fatigue, skin changes, and appetite loss. chemotherapy can generate variety of side effects. Hey there, I stumbled upon your site by way of Yahoo though searching for a very similar matter, your internet-site got here up, it looks just like very good. I have got book marked in order to my favourites types|combined with favorites. I surprise how so much effort you place to make this kind of magnificent informative website.